Apple filled out its iPad lineup on Monday. As expected, the company announced a new 9.7-inch iPad Pro. The new model doesn't replace the year-and-a-half-old iPad Air 2, despite having pretty much the same form factor. Instead it strikes a middle ground between the size of the iPad Air 2 and the performance of its 12.9-inch sibling released last fall. It also strikes a middle ground in terms of price, coming in at $200 more than the iPad Air 2 and $200 less than the larger iPad Pro. Apple also bumped up the storage options for both iPad Pro models, for the first time offering a 256GB storage option on both. The new available storage tiers include 32GB, 128GB and 256GB. Overall, this rounds out the iPad lineup with a range of three form factors (12.9-inch, 9.7-inch and 8-inch) at broad range of price points starting with the iPad mini 2 with 16GB of storage at $269 all the way to the 256GB, 12.9-inch iPad Pro with cellular connectivity at $1,229. With that range, Apple has really diversified the iPad from its one-size-fits-all beginnings six years ago, to a product line that hits a very wide swath of demographics, user needs and price points. This has been a major theme in Apple's marketing of the iPad Pro since the larger model launched last year. It's certainly true that the device offers desktop-caliber performance, and an excellent screen, and can function as a de facto laptop in the same way as can Microsoft's Surface Pro. But whether the iPad Pro, large or small, is the right business or professional computing solutions depends on a range of factors: The nature of a company's business, the specific job roles of employees, the need to run dedicated Windows apps, the desire of users and managers to select the best solutions for their needs (an increasing factor in IT decision making), and the infrastructure in place to support mobile devices. There is no clear right or wrong answer. It depends on the needs and capabilities of an organization and its employees. During both iPad Pro launches, Apple has positioned the devices as being business-ready due to a range of business tools, content creation and design apps, and multitasking features like iOS 9's split screen mode. One push for Apple's Smart Keyboard for both devices is its support for desktop-like keyboard commands and shortcuts. Apple does make a compelling case for the iPad Pro models as powerful business tools, including several of Microsoft's own apps including Office. The company's new iPad Pro highlights other tasks like shooting and editing video, brainstorm and mind mapping (including doing so while video chatting thanks to iOS 9's picture-in-picture feature), 3D modeling, and even scanning and editing pages and forms. Given the range of industry-specific apps and in-house enterprise apps, and the range of business apps emerging from Apple's partnership with IBM, Apple's promotional materials are really just scratching the surface (no pun intended) of the iPad Pro's capabilities in business. That doesn't mean the iPad Pro (large or small) is an easy fit as a PC replacement in every workplace. As I wrote last year when comparing the larger iPad Pro to the Surface Pro 4, the major difference in the products are that the iPad Pro runs an OS designed for mobile while the Surface runs a full version of Windows. This allows easy access to legacy Windows apps, most notably existing in-house enterprise apps that may have been in use for years or decades, as well as direct integration with Active Directory for both authentication and management. Apple does offer a range of iOS management capabilities through MDM/EMM solutions, which also can use Active Directory information for applying policies. The company is also testing the waters of multi-user functionality in iOS 9.3, though that functionality is limited to the education market. Neither option, however, offers the full range of controls and capabilities offered by joining a device to an Active Directory domain; whether that range of controls and capabilities is truly needed depends on the organization. As much as there are reasons for some organizations -- or some departments within an organization -- to opt for Windows PCs or tablets like the Surface, there are also many situations where an iPad Pro might make more sense. That could be because of the mobile nature of some workers (sales professionals, healthcare workers, field service staff, etc.) or because the apps and features available on the iPad Pro lend themselves more easily to specific tasks. From either a business or consumer perspective, the big news about this week's announcement is as much about the broader iPad lineup as it is about the new iPad Pro itself. There are definitely some apps, tasks and business processes that can benefit from the power of either new or old iPad Pro. These include handling complex Office files like large spreadsheets and large embellished PowerPoint presentations, 3D modeling, graphics or video work for example. Some of those may also benefit from the screen real estate of the larger model, but many may simply benefit from its sheer processing and graphics capabilities. Some may even benefit from the performance but also be more well-suited to a smaller and easier-to-carry form factor. 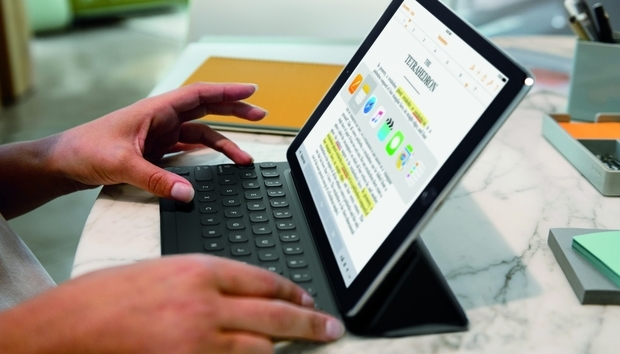 Indeed, the portability of the 9.7-inch form factor has been one reason the iPad has been a popular choice among business travelers over a laptop or even a larger tablet like the Surface or larger iPad Pro. As I and several of my colleagues have noticed, a 9.7-inch iPad with a keyboard case -- or now a Smart Keyboard -- is a lot easier to use when working on a plane, and it fits much more easily on a seat-back table. The smaller iPad Pro's combination of portability and performance do make it a serious contender for many mobile professionals. The price point also offers its own advantages. For tasks that need the added performance but may not need the extra size, the new iPad Pro allows for notable cost savings over the larger model. This is particularly true in the enterprise space where devices are often bought in bulk and where that $200 price difference can add up very quickly. At the same time, there are many business tasks and apps that won't benefit from the added performance of the iPad Pro. Light editing of Word documents, submitting/processing expense reports, booking business travel, email, accessing corporate cloud services, and even running Windows apps through VDI are all common business activities that don't require significant processing power and/or where connectivity and not the device's raw processing capacity is the arbiter of performance. In these cases, the iPad Air 2 can easily suffice and offer additional cost savings. This extended range of options in terms of form factor, performance and pricing is good news for organizations deploying iPads. It allows tailoring purchases to the needs of specific departments, job roles, individual users and budgets. While the major differences between the larger and new smaller iPad Pros are the form factors and the price points, it's also worth noting that the new iPad Pro actually offers some features that its larger sibling doesn't. Perhaps even more noteworthy differences relate the new iPad Pro's display. The True Tone display on the smaller iPad Pro adjusts the color temperature of the screen to ambient lighting conditions. This can make viewing the screen easier in a range of situations and as a user moves from one environment to another. This has obvious impacts for visual comfort, but it also has potential benefits for editing content or displaying content to clients or coworkers. An equally important, if not more important, distinction is the reduced reflectivity of the display. Apple claims it is 40% less reflective than other iPad screens and is the least reflective display in the world. Anyone who's ever tried using an iPad outdoors will appreciate this feature and many will recall that Amazon built an entire ad campaign around the Kindle eInk display's ability to be used in sunlight. Regardless of whether or not millions or consumers or business users will be trading in their five-plus-year-old PCs for the new iPad Pro -- as Apple seems to be hinting at -- the device definitely rounds out the iPad lineup very nicely. It has a lot to offer in terms of specs and features, but what makes it really significant is that it offers a greater range of choice for selecting the best iPad for a given job.